For curious readers who wish to hone their psychic skills, a plethora of occult tomes, lost scrolls, and even stranger items lie hidden throughout Golarion. 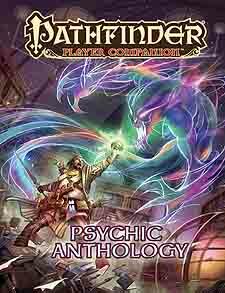 From the kaleidoscopic Recursion Tablets to the never-ending infinity Scroll, Pathfinder Player Companion: Psychic Anthology presents a diverse archive of texts elucidating esoteric ideas and techniques that can benefit any psychic spellcasting class, as well as other spellcasters. Alongside feats, magic items, and spells, this volume unlocks the hidden powers of the mind! New archetypes for nearly every occult class, including the phantom blade spiritualist and the autohypnotist mesmerist. Panoplies - collections of occultist implements that harness the power resonating between the items - and numerous kineticist wild talents for all the elements. A new corruption arising from raw psychic energy that, if left unchecked, could mutate one's form into an all-consuming horror of writhing flesh.